Speaking of time machines and synthetic textiles in the last post made me think of Bri-Nylon. 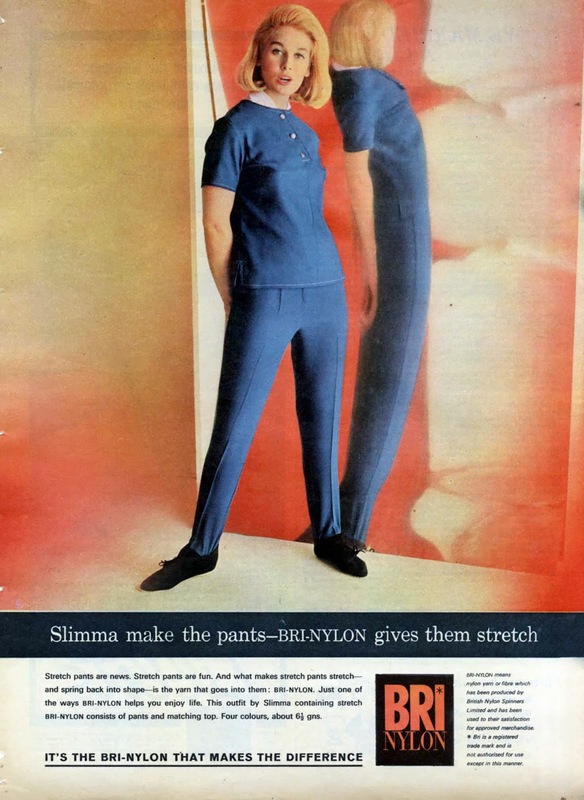 Which made me want to look at it again, which led me to a site with vintage ads for Bri-Nylon. The purple prose in this ad from 1973 is hilarious. It reads like a parody of a parody. She slithered into the soft luxury of the passenger seat. He watched her long legs as she swivelled round, arranged her skirt and self-consciously crossed her legs. He shut the door and walked round his most prized possession. The car had been his for one whole week. He got into the driving seat, lit a cigar and leaned back to savour the moment. The seats were soft and comfortable. ‘Bri-Nylon’ he mused; surprising the impression it makes. ‘Bri-Nylon’ he mused; surprising the impression it makes. That should win some kind of award. Excited by the value Bri-Nylon adds to his ‘most prized possession’ the hero pauses to contemplate the synthetic mysteries of Bri-Nylon, remembering how he chose it for its ‘practical virtues’. Which were copied straight from the brief—Bri-Nylon wears and washes well, it’s cool in summer, warm and inviting in winter. With that, the ‘practical virtues’ messaging has been folded into the seduction story, freeing the copywriter to cut to the chase and deliver the big payoff: ‘Your place or mine?’ The seductive power of Bri-Nylon is mighty. Strange that the man is described as getting into the driver’s seat, yet in the illustration, only the woman is sitting in the car. But I expect that was wholly intentional, the purpose being to invite the male reader to imagine himself sitting behind the wheel and next to the passive chick (the prize), who waits only for him, ready to frolic and luxuriate in the Bri-Nylon surfaces. And what can be said about the gem from 1970, below? Bri-Nylon pajamas for men—and why not? It’s what every man needs for those moments in life when cotton just won’t do. This ad is actually trying to position the value and appeal of the Bri-Nylon leisure lifestyle, yet succeeds in making it seem humiliating and horrifying—aesthetically, bodily, and in every way imaginable. You have to wonder what they were thinking—and that goes for the manufacturer, the product designer, the art director, the models and the consumers who bought these pajamas. What was the lure of Bri-Nylon? Who would willingly want to dress and look like the men in the ad above? Yet somehow, culturally, this totally synthetic clothing experience was seen as a positive and embraced. Was its appeal and acceptance driven entirely by advertising? Does anyone need the assistance of nylon stretch pants to enjoy life? In a word, no. And dressed like that, encased in shapeless stretch synthetic fabric that doesn’t breathe and spreads over the body with its own agenda (what’s all that bunching action around her ankles?) it would be impossible to enjoy anything.